Why This Book | Boring to Brilliant! Why This Book Is Needed Now More than Ever – In Business and In Life! The world of business is more competitive than ever, and every advantage is needed to help organizations succeed. Speaking well in public is certainly a point to differentiate the outstanding leaders from the average leaders. This book helps you to polish your content, delivery and impact! 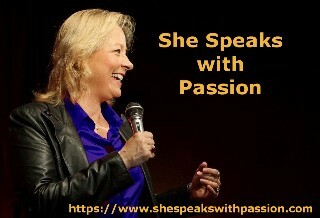 Women also need to grab the microphone and take center stage with their ideas and talents! Barbara is determined to help facilitate this with women from all walks of life. In October 2017, Barbara will launch a new communication membership where she will coach, mentor and train women to step up and speak up for what they want! What Motivated This Book to be Written? Coming from a successful 15 year corporate sales career, Barbara had to endure many boring presentations over the years. She noticed that some were SO boring, that, they even became painful to sit through. She vowed to start a company to help executive speakers to impact the audience with clear messages and strong delivery. The key was to focus on audience engagement and finding the authentic style of the speaker and bring out the best in them. Barbara founded Successful Speaker Now in September 2011 and has coached more than 140 TEDx speakers and Fortune 500 executives. All of the techniques, tips and tools that she uses with her TEDx speakers can be found in the Boring to Brilliant! A Speaker’s Guide.